Previously I had modeled long term unemployment by comparing long term unemployment durations to short term unemployment durations. Here I have modeled long term unemployment rates as a linear combination of the shorter duration unemployment rates, to compare the results to the other model. The results turn out to be similar. Here is the 66 year history of the model. The specification is based on the relationship from 1948 to 1991. The deviations of the model in 1992 and 2002 coincide with the previous two recessions and the previous two EUI episodes, which were much less generous than the recent episode. Next is the difference between the modeled Long Term Unemployment Rate (over 26 weeks) and the actual LT Unemployment Rate. This is similar to the numbers I have arrived at through other methods. And, I believe the story is similar for the current labor market. 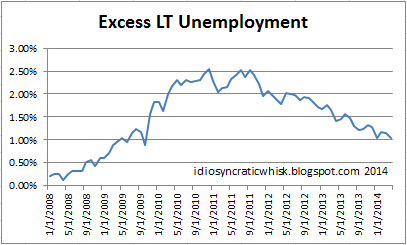 The very long term unemployed seem to have a linear behavior that is not related to EUI policy at this point, because this group had probably mostly already timed out of the program. As with my previous estimates, this estimate suggests that this group is shrinking by about 0.05% of the labor force each month. So, if this continues, the unemployment rate should continue to decline by about 0.6% over the next year. I think that this method does help show how the end of EUI has filtered through to recent declines in the unemployment rate. Beginning in the fall of 2013, unemployment durations of 5 to 26 weeks acquired a new, sharply declining trend, which has continued through April. Durations from 15 to 26 weeks might continue to decline by about 300,000 (about 0.2%) over the next few months, but that would bring it near to probable trough levels. These recent declines in short term unemployment should filter through to long term (>26 week) unemployment, with 0.1 - 0.2% in future declines already in motion and another 0.2 - 0.3% decline possible if the 15-26 week category continues to decline. I think this realistically adds up to declines by the end of 2014 of about a 0.4% UE decrease from the VLT group and another 0.4% UE decrease from the trends that began in late 2013 in shorter duration categories and the expected declines those trends should produce in the long term category. That puts us at 5.5% unemployment by the end of 2014. It is possible that these trends will dissipate, but there is no evidence of that happening now. And there might be some snap-back from the April number, but I don't see any reason to expect anything above, say 6.4%, even figuring on some noise over the next couple of months as the downtrend continues. The Employment to Population Ratio has shown some slight momentum over the past couple of years, but labor force participation continues to show weakness. This doesn't quite fit with my amended theory of the EUI. I would have expected some weakness coming out of EUI as some relatively small proportion of long-term unemployed would have exited EUI by exiting the labor force. However, if there is this bifurcation among long term unemployed, and if the end of EUI didn't really affected the behavior of the very long term unemployed, I wouldn't have expected there to have been much LFP weakness. If the end of EUI mostly caused an exit from unemployment among unemployment durations of, say, 5 to 40 weeks, I would have expected a smaller portion of those beneficiaries to have left the labor force. But, there does seem to be some weakness in LFP coincident with the end of EUI. We might continue to see more of this weakness over the next few months before LFP finally settles back into a direction parallel to (or reverting to) the demographically adjusted trend. Good stuff. Just remember, the number of Americans receiving "disability"---whether VA or SSDI---dwarfs the number receiving unemployment. There are about 12 million receiving disability. Thanks for the input, Benjamin. I have been tracking what I think are the three most acute disruptions to the labor market - demographics, minimum wage hikes, and EUI. I don't have the links handy, but from what I have seen, I have been convinced that the disability issue is a subset of the demographics issue. There is a large jump in disability applications when age cohorts hit about 50 years old. I have read arguments (which were convincing to me) that the recent jump in disability rolls is mostly a product of the baby boomers hitting the age bracket - over 50 years old but before social security eligibility - and that once this adjustment is made, the level of disability beneficiaries is not far from what we should expect. So, I think that the effect of this trend is already baked in to the long term labor force participation trends of the different age groups, and covered by the "demographics" category. While disability benefits seem like a reasonable policy of an empathetic society, it really is a disgusting way to distribute social benefits, because beneficiaries subsequently can only engage in self-improvement or productive behavior at the risk of losing their benefits. It's a kind of psychological infliction that only a monster would want to impose on someone. It would be so humane to replace it with some kind of guaranteed income, or something, anything. We have this large contingent of citizens that we support at barely subsistence levels, and threaten to revoke it if they dare to act productive. But, that being said, I think it's yet another issue that we can chalk up to baby boomers, and it will revert to lower levels as they age out of it. Reviewing this post, and this comment, the issues I list are structural issues, but obviously monetary policy has had a lot to do with employment, also. And, I think I have come toward Benjamin a bit on the disability issue. Here's a post where some increases in disability beyond demographic trends appear to be part of the story.